Analysis of public discourse online reveals overwhelming majority defend the soldier who was filmed shooting a wounded terrorist. 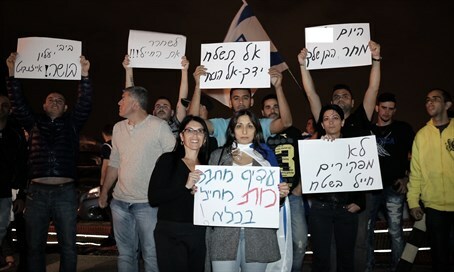 An analysis of the public discourse online regarding the IDF soldier who last Thursday was filmed shooting a wounded terrorist in Hevron has found an overwhelming majority of Israelis back the soldier. A full 82% of the sentiments posted online from last Thursday up until Sunday morning at 11 a.m. were in support of the soldier, according to the company Buzzilla that specializes in analyzing social networks. The results were published by Channel 2 on Sunday. The soldier is currently being tried in a military court on charges of murder, after an activist of the radical leftist NGO B'Tselem filmed him shooting the terrorist mere minutes after the latter stabbed and wounded a soldier. The soldier has argued he shot the terrorist over concerns he was about to detonate a bomb belt that was thought to be hidden under his unseasonable coat. Since the incident broke last Thursday, the Buzzilla analysis found that social networks in Israel - primarily Facebook - have been filled with groups supporting the soldier. There are at least 20 such groups that have been started, with a rapid rate of joining at over 13,000 members. In addition a petition has been launched backing the soldier, and already 37,000 people have signed onto it. Buzzilla checked what people were writing on the comment sections of news sites, forums, blogs, and social networks. A sample was selected from the results representing the ratio between each platform that was examined. A sample of discussions was checked, with each discussion consisting of the string of comments from the first post to the last post, and each discussion was individually read and analyzed. The major reasons given by those supporting the soldier were phrases such as: "when someone comes to kill you kill him first," "the IDF has to back its soldiers 100%," "the soldier feared a threat from the terrorist (a bomb belt)," and "they're giving the soldier a lynching, they have to wait for the trial."